The Aguila factory in Mexico has been in the ammo business since early 1961 and is still producing high quality cartridges every day. 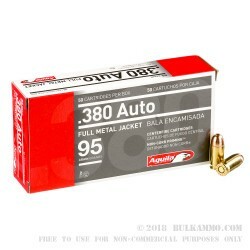 Their ammo is manufactured by TECNOS Industries which is highly regarded as one of the highest output ammunition manufacturers in the market. They are constantly updating and revamping their equipment to increase production and send more cartridges out the door. 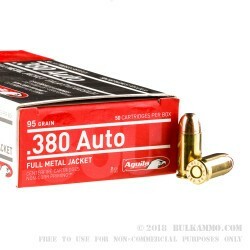 These Aguila .380 caliber bullets are 95 grain and they are built with a lead core and a full metal jacket. They come loaded into brand new, highly polished, reloadable (with the right equipment), non-corrosive, Boxer primed all brass cases. These rounds have a subsonic muzzle velocity of 945-feet per second and a muzzle energy of 188-foot pounds. 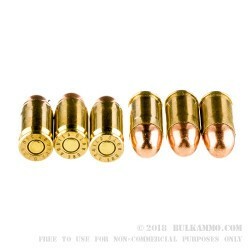 These loads are easy to handle, with minimum recoil, and a great platform to teach the fundamentals on for your family members or friends who want to learn to shoot without the recoil and flash of a heavier caliber. 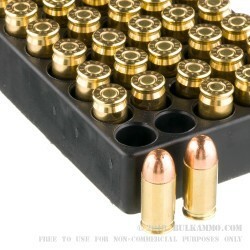 They come in a 1000 round bulk pack, ready to store in your armory, take out to the range, or test out a new firearm with. Get your cases now. Q: What is the foot pounds? A: Hello Jan, Aguila lists the muzzle velocity at 945 fps with a muzzle energy of 179 ft. lbs.